Place the leg of lamb on a chopping board and open so that it is flat against the board. Combine the mandarin juice with 200g water and add the salt. Finely chop the lemon thyme and add to the mixture. Rub this mixture onto the inside of the lamb, making sure to cover every section of the meat. Place in a container, cover and place in the fridge for 12 hours. Remove the lamb from the marinade and spread on the mandarin zest. Re-roll and tie into a long joint using butcher’s twine. Place the rod from the spit through the middle of the leg and fasten using the adjustable forks. Secure on the highest setting of the spit on the Fusion BBQ and light the coals. 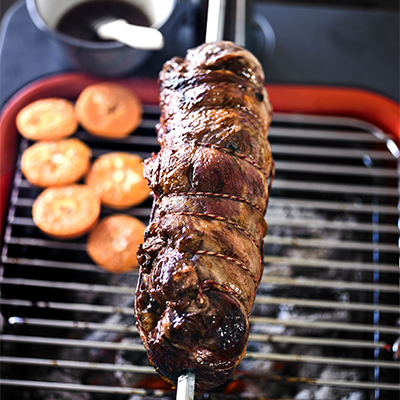 Maintain a temperature of 60°C at the surface of the meat by moving the coals around. Cook for approximately 3 hours or until a core temperature of 58°C is reached when probed. In the meantime, prepare the glaze by heating the lamb stock in a pan over moderate heat, and reducing to 200g. Combine the reduced stock with the remaining ingredients. Brush the glaze onto the meat regularly after the first hour of cooking and continue to do so for the remainder of the cooking process.